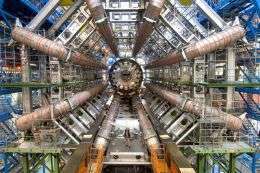 (PhysOrg.com) -- On August 8, the world's largest particle accelerator, the Large Hadron Collider near Geneva, Switzerland, began the process of slowly throttling to full power. When its proton beams are circling at full speed and collisions begin, scientists from around the world will finally be able to start collecting data. LHC collisions may reveal new clues about the origin of the universe, new particles, new dimensions, and perhaps even new physics even theory doesn't predict. But will the collisions be powerful enough to create a tiny mass of particles with a gravitational pull so strong it can "eat" other matter -- a microscopic black hole? And if yes, could such a thing grow big enough to swallow Earth itself? The fact is, the LHC could produce a tiny, extremely short-lived (read: harmless) black hole. It is an unlikely event, but one that physicists are nonetheless excited about. However, they discount the possibility of a stable black hole -- one with the chance to grow into something worth worrying about -- as much more science fiction than science. Recently, two physicists took a close, practical look at the issue by examining known astrophysical phenomena, using what scientists already know about the universe to determine the likelihood that the LHC will produce stable black holes on Earth. The physicists are Steven Giddings, of the University of California-Santa Barbara, and Michelangelo Mangano, of the European Organization of Nuclear Research (CERN), which built the LHC. In their paper, published in the August 18, 2008, online edition of Physical Review D, they examine the "extremely hypothetical scenario" in which black holes are created at the LHC, are stable, and become trapped within the Earth. Would we be doomed? The short answer is no. Giddings told PhysOrg.com, "We went to great pains to thoroughly investigate possible risk in even some very outlandish proposals for black hole behavior, and found we could safely rule it out. The basic reason is simple: Nature has been performing this type of experiment for billions of years, not only on our planet and sun, but also on much denser objects, like neutron stars and white dwarfs. Their enormous age reassures us that physics doesn't exhibit the bizarre behavior that LHC opponents have suggested." Giddings and Mangano's first argument against stable LHC-produced black holes is the fact that scientists almost universally agree that black holes evaporate, emitting particles called Hawking radiation, named for Stephen Hawking, who proposed the phenomenon and showed why it exists. A microscopic black hole would thus be very unstable, disappearing in the tiniest fraction of a second. They also remind us (in an argument presented in the past) that collisions with the same power as those to be produced at the LHC—in the trillion electron volt range—happen all the time on Earth, when cosmic rays from deep space (protons with extremely high energies) collide with molecules in the atmosphere. The quick, logical conclusion is that such events, if they could produce dangerous, stable black holes, would have already done so. But Giddings and Mangano consider two scenarios that aren't quite so simple: if a stable black hole created in the atmosphere carried a charge, or if it was neutral. They calculate that a charged black hole produced by cosmic rays wouldn't be able to travel very far before it was drained of energy by the material of the Earth, or if very energetic, by the Sun. If charged black holes have ever been produced in our atmosphere, our existence is proof they are safe. At the LHC, a black hole would likely be charged because it would have been produced by collisions between quark pairs (quarks have charge). But if the black hole was neutral, and if it was also stable, emitting no Hawking radiation, that could be troubling. Giddings and Mangano examine this scenario despite that the likelihood of it occurring is almost zero, since scientists believe that neutralization could not occur without the emission of Hawking radiation. Neutralization and Hawking radiation are intricately linked quantum processes; if one is occurring, the other should be, too. Over pages of analysis, they show that there are two possible cases of stable, neutral black holes. Which of these cases could be true depends on which physics theory of extra dimensions (there are competing theories) is correct. The first case is the slow growth of a neutral, stable microscopic black hole. If such a black hole were produced on Earth as a result of LHC collisions, its growth would take place on a time scale longer than the natural life of our sun. That means our star would burn out before we were in danger. This leaves the second case, of growth faster than the sun's lifetime. Such stable, neutral black holes would also be created by cosmic-ray collisions. Because of this, Giddings and Mangano's paper shows that much denser objects than Earth and the sun, such as white dwarfs and neutron stars, which are already close to collapsing in on themselves, would be destroyed by such black holes. The simple fact that these stars still exist excludes this second case. That leaves the first case as the only possibility in the case of stable, neutral black holes. And as Giddings reminds us, "The overwhelming majority of the scientific community agrees that the stable scenarios are crazy anyway." energetic collisions far exceeding the amplitudes found in the LHC occur in the Sun and other stars all the time. If these kind of interactions could have caused black holes we wouldn't have a Sun. since black holes are a mathematical abstraction and don't actual exist (as in a very dense object) then we have nothing to fear. "The overwhelming majority of the scientific community agrees that the stable scenarios are crazy anyway." Crazy are that black holes actual exist! bonkers! Let's way for Alizee to come and comment on this. I believe that he/she has something to say on this! This paper (and for once a decent article describing it) describes some thoughts that I've had for some time. Even if a stable micro blackhole were created, it would take such a long time to accumulate a dangerous amount of mass that we would be in no danger. Even the simplistic back-of-a-cocktail-napkin calculations that I can do should have indicated that to the anti-LHC crowd. But they're too good for, you know, logic, I guess. The problem is that we are speculating about that we think we know what is going to happen. If we would know the outcome at forehand, then we would not be experimenting. And if we don't know the outcome (that is why we are experimenting) then we take the risk that the outcome is complete destruction. Its just that we don't know. Then if we decide to not to do the experiment because something can go wrong then I suggest to stop changing lightbulbs at home too. You may fall from the ladder and drop dead, or a lightning may strike in the electricity pole while changing the bulb, and hit you. Do not confuse experimenting the unknown where you are quite sure that there is no harm, with experimenting with nuclear bombs, while the calculations were done for destruction. Anyway if we were wrong, then.... nothing matters anymore anyway. why everytime i say lhc in my head it comes out "Large Hardon Collider". Ironic that this incredibly naive and pompous sort of ignorant assurance has also been stated arguing against an expanding universe, relativity, a spherical Earth, galaxies, dark matter, DNA, and countless other now-proven aspects of reality. Reminds me of the fact that when they first tested the H-bomb, qualified opinion existed warning that there was arguably real risk of the event igniting the entire atmosphere, instantly extinguishing all life on Earth. Now, if you will, ponder your current opinion of the state of technical knowledge about nuclear physics and fundamental particle behavior at that time (1950's) and retrospectively ponder the immensity of the risk these people blindly took on - the eradication of all life vs. a little simple fusion weaponry technology. I have a hunch I'll look back at the start-up of LHC 40 years from now (assuming we still exist), shake my head and await the next pseudo-scientific assurance of our safety adjacent to the next generation ultra-high energy playground. As a side-note, we may be looking at the explanation as to why we have not ever encountered any indication of any other technologically species. This might be the literally existential litmus test. Fail it and your planet winks out of existence. Jackbzb just said it all, scientist seem so sure of the models yet get so much wrong in predictions of how our universe works. We drive forward and i 'hope' life stays as lush for us all. what a relief! Of course if the physicists are wrong we're all dead of a graivtational collapse. But, what if a really big number of microscopic black holes are created? Over pages of analysis, they show that there are two possible cases of stable, neutral black holes. ..depends on which physics theory is correct. Does this analysis also suggest an empirical test between those two competing theories of physics? ..That leaves the first case as the only possibility ..
Would the physicists opposed to the first case theory agree? On one side they claim that they successful cooled down the LHC below the temperature of space but on the other side they say that events like this happen in nature all the time. So according to the Ph.D. and Prof's temperature doesn't matter. Guess they should once stick there hand's in a Ice bucket and then into a pot of boiling water. First feels the same but they may discover the difference afterwords. So I look really forward when they start and maybe they proof the sun is circling the earth. Looking forward to when they push the button. kniedzius you just had to say it didn't you! Alizee is all over this damn article. I think we've defiantly seen proof here of the latter. with that said my question is ..
how can a comparison be made to the conditions of and what goes on in space v.s. the conditions of and what goes on here on earth?.. it would seem to me that the natural occurrences that take place out there would differ than from here on earth!.. i.e. the atmosphere, temperature, matter, density and stuff like that. would the outcome be the same and if so why? according to other physicists it indeed may be possible. all great minds on both sides. but neither 100% sure what will happen..
[If these exotic particles evaporate or grow extremely slowly, then there would be no problem. However several PHDs in Math and Physics and other theoretical sciences (I can provide quotes and links) believe that BOTH might be false. Micro black holes may likely NOT evaporate and they likely might grow relatively QUICKLY. who do you believe? who is wrong and who is right? the one who makes the most sense? the one with a higher degree? how can u tell who has a better understanding? and once you figure it out and decide will it really make a difference or change anything? its seems to me the possibilities of any one of these things happening.. (good or bad) is very real!.. no matter how far out it seems or sounds. without 100% certainty.. how can anything be dismissed?